Swedish ufologists Anders Skoglund and Christoffer Mossberg recently came across a very fascinating story told by a woman living in the south of Sweden. I was briefed of this encounter in an email from my UFO research colleagues on June 18. The observation occurred in Tunisia in the 1980s where the family for many years spent their summers. This is only a preliminary report and I hope Anders and Christoffer will continue investigating and documenting this extraordinary case. ”It was during Ramadan and me, my husband and two children had visited mother-in-law in the evening. It is around midnight when I drive our car to the house we are building, about 7 kilometers from the city. Our house is situated between two villages. About 150 meters from the house is a railway and from what I remember there were seldom any trains coming. When we approach the railway crossing the red lights begin flashing. We stop just a few meters in front of the railway tracks, waiting for the train. There is no sound from any train and instead four or five bright creatures appear in front of us, walking in the middle of the tracks. They walk behind each other with arms stretched to the next in line. Their heads are large and round and narrowed at the chin. 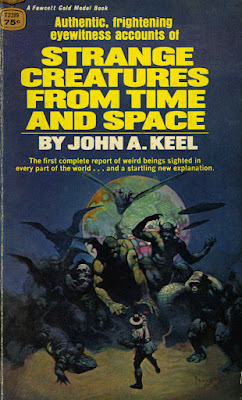 The beings look straight ahead, never turning towards us. 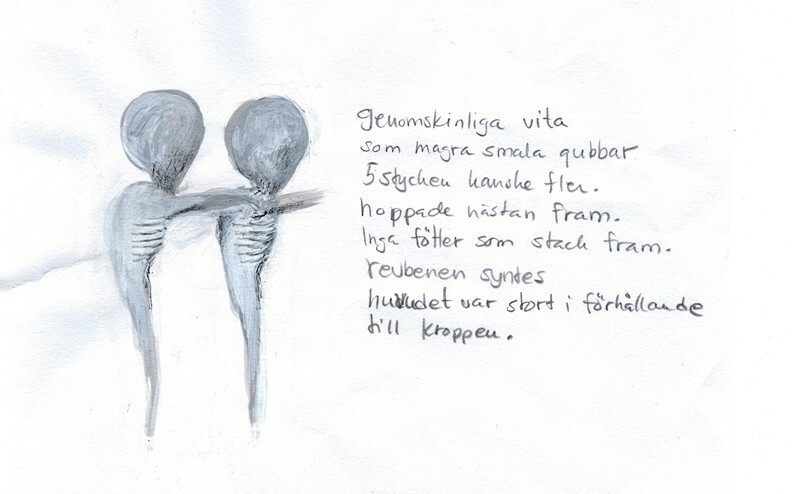 They are extremely thin, almost like skeletons. We can see the bones in their chest. Feet are very small and they almost jump ahead. Their height maybe two thirds of ours. Actually they looked like very skinny old men. Our children are asleep. Me and my husband remain silent and just stare at these beings. When they had passed the red lights are turned off and we can continue driving. We are still silent, wondering what we have witnessed? I just want to go come home as fast as possible. When finally at home and our children asleep we sit down at the kitchen table and we both asked ourselves – what was it we encountered? This observation is especially intriguing as the beings obviously affected electricity in the railway lights. This is often mentioned in UFO reports but I have no knowledge of this physical effect in creature encounters with no UFO. The comment on jinns is also interesting as there is a rich folklore on these beings in Arabic countries. Jinns are also an important part of Islamic theology and often mentioned in the Quran. There are several classes of jinn, both good and evil. In several respects they can be compared to demons or nature spirits in the Western world. Flying Saucer Review editor GordonCreighton, who became convinced that UFO entities were evil demonic entities sometimes in his articles compared them to jinns. This encounter in Tunisia has some similarities with an observation made in Estonia 1938 or 1939. In two letters to Swedish ufologist Sven Schalin, 1959, the witness Karl Laiande narrates what he observed together with a friend in the village Juminda, Estonia. The event occurred on the farm owned by the grandparents of Karl Laiande. He first noticed someone trying to crawl through a crevice between a small shed and a fence. Something looking like a human hand appeared and Karl´s first thought was that his younger brother was trying to sneak up on them. But he soon realized this was something entirely different. The being that appeared was no human. 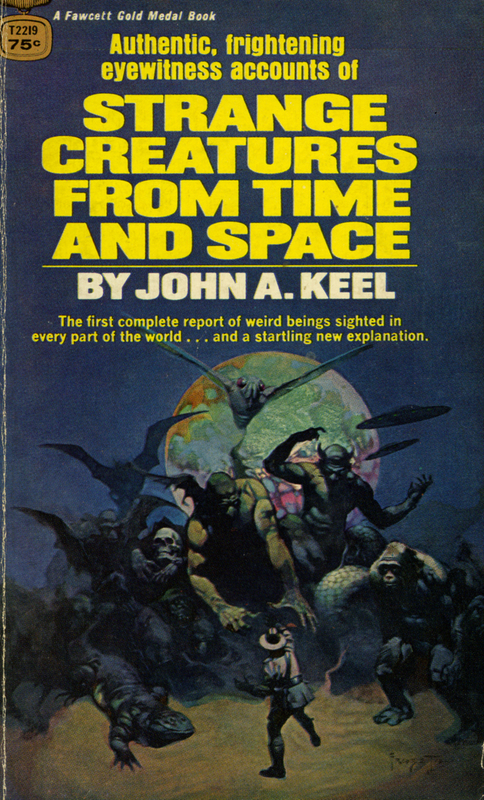 Karl made a sketch of the creature attached in the letter. In his letter Karl Laiande explain that he has tried to find a scientific explanation for this encounter: ”I consider this experience as an undisputable evidence that our planet is visited from space”. His two sisters and uncle to whom he related the observation are convinced he has seen a ”kratt”, a magical creature in Estonian folklore, made by flour and blood from the person who made it. The comment made by Karl´s relatives is very interesting as they probably are closer to a correct interpretation than Karl himself, who tries his best to find a reasonable scientific explanation. From an esoteric viewpoint the creature encounters in Tunisia and Estonia open up two possibilities. Either nature spirits using the above forms in materialization or elementals created consciously or unconsciously and temporary appearing in visible form. I would vote for the latter interpretation. 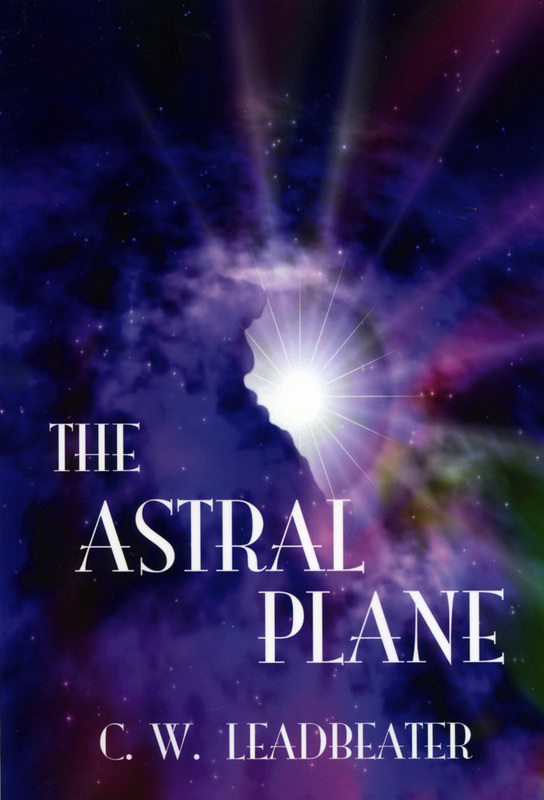 To understand these phenomena we must consult one of the best sources presenting a detailed taxonomy of non-human entities, Theosophist Charles Leadbeater´s classic The Astral Plane, published already in 1895. A magnificent contribution to esotericism as a science of the multiverse. The writings and investigations of Charles Leadbeater are very controversial among Theosophists. 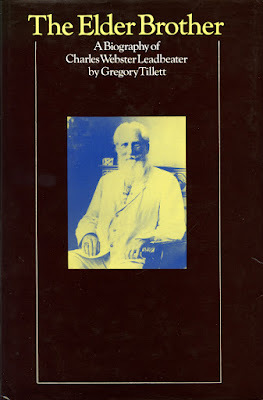 One of the reasons being his sometimes rather excentric behavior and controversial sexual activities, documented by Dr. Gregory Tillett in his biography The Elder Brother (1982). But in spite of his faults and mistakes Leadbeater was a pioneer in his research and writing. Commenting on some of his mistakes The Tibetan D.K. still has this to say: "... of his sincerity and of his point of attainment there is no question." (Alice Bailey, Esoteric Psychology II, p. 303). In this way anyone with enough concentration and will power can create an artificial entity of any form. This experiment was successfully tried out by a group of parapsychologists in Canada who together created the elemental ”Philip”. They documented the experience in the book Conjuring up Philip. An Adventure in Psychokinesis by Iris M. Owen and Margaret Sparrow (1976). Creating a tulpa, golem or elemental is not recommended. A lesson that was learnt the hard way by Alexandra David-Neal who created a tulpa in the form of a monk. It took her six months of hard struggle to dissolve the phantom. (Alexandra David-Neal, Magic and Mystery in Tibet, pp. 314-315). In the future the knowledge of how to materialize thought-forms will be known to humanity, according to the Tibetan adept D.K. : ”People will come into incarnation who will have the ability temporarily to create and vitalize these though-forms, and so enable the general public to see them. The time, however, is not yet. There is too much fear, and not enough experience of truth in the world. ” (Alice Bailey, A Treatise of White Magic, pp. 182-183). Encountering the little people, leprechauns or fairies is usually a nice and fascinating experience. Coming face to face with an elemental can be quite the opposite, depending upon how and for what purpose it was created. Maybe you then should pronounce the words of Rav Zeira said when meeting a golem: "You were created by the sages; return to your dust". In an email from Dr. Tim Rudbøg, Associate Professor, Department of Cross-Cultural and Regional Studies, Copenhagen University, I was informed of his recently founded Copenhagen Center for the Study of Theosophy and Esotericism (CCSTE). A commendable effort that I hope will inspire scholars to in-depth research into the much neglected history of the Theosophical and Esoteric movements in Sweden. 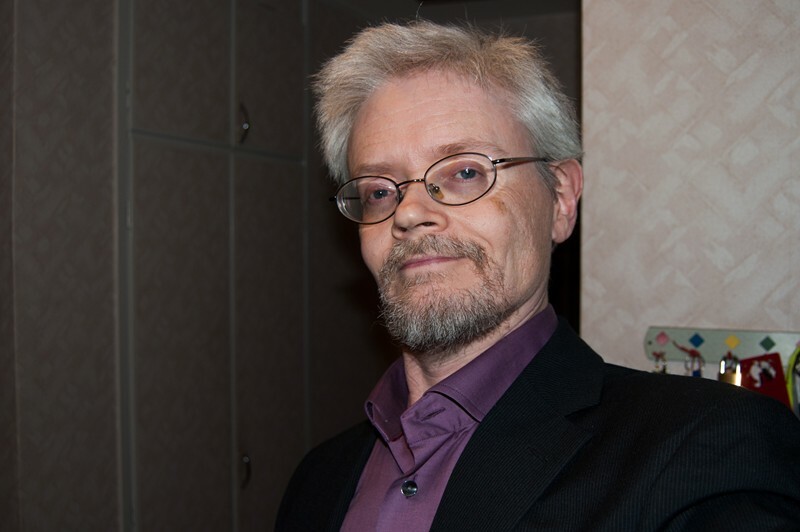 Dr. Rudbøg is one of the foremost international experts on Western Esotericism and author of several books relating to esotericism. He is also a specialist in rare occult books and proprietor of H.E.R.M.E.S.`Antiquarian. 1. A detailed history of the founding of the Theosophical Society in Sweden. Cultural influences, personalities involved, official debate. 2. A biographical study of Countess Constance Wachmeister (1838-1910). 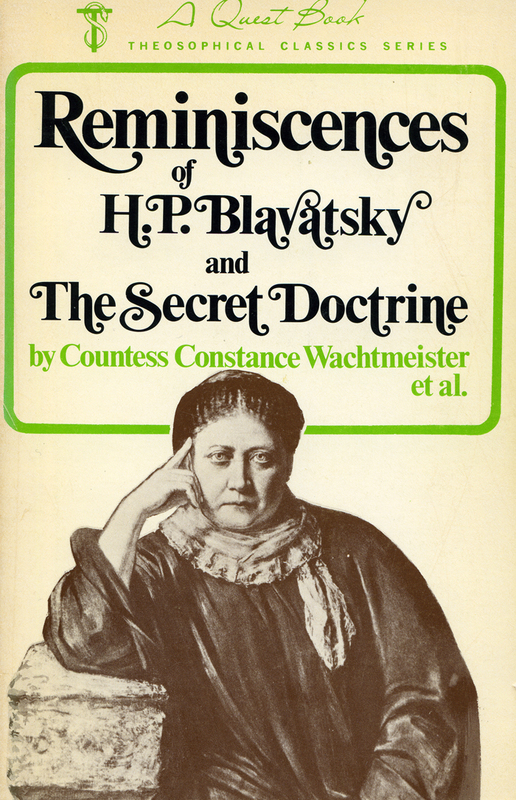 She was a close friend and important co-worker of Helena Blavatsky. 3. Theosophy and the Swedish King Oscar II (1829-1907). He was strongly influenced by Theosophical ideas and invited Henry Steel Olcott and Annie Besant for audiences at the Royal Palace. 4. The cultural influence of Theosophy in Sweden 1891-1930. During these years Theosophy had a very extensive cultural impact. Theosophical ideas influenced famous authors like August Strindberg, Gustaf Fröding and Selma Lagerlöf. Well known members very psychologists Sidney Alrutz, Bror Gadelius and painter and Gustaf Fjæstad, member of the Rackstad colony of artists in Värmland. 5. Krishnamurti and the crisis of Swedish Theosophy1929-1930. In 1925 there were 45 local Theosophical lodges in Sweden. Many of these lodges folded or ceased activities during the period 1929-1930. How did members and the general public react when Krishnamurti disavowed his role as World Teacher? 6. 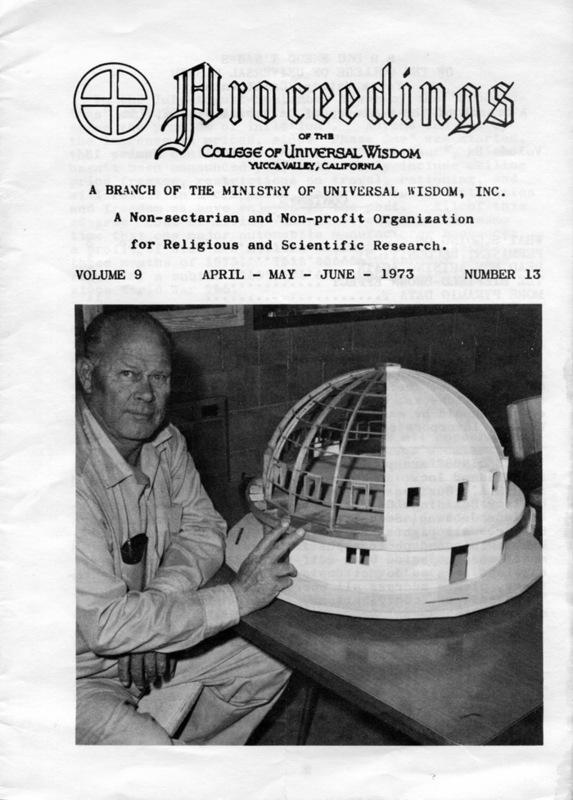 Esotericism and the founding of the UFO movement in Sweden. Many of the first generation ufologists in Sweden were active Theosophists or members of various occult societies. The first Swedish UFO organizations of 1957-1958 were actually founded by members of the Theosophical Society Adyar. 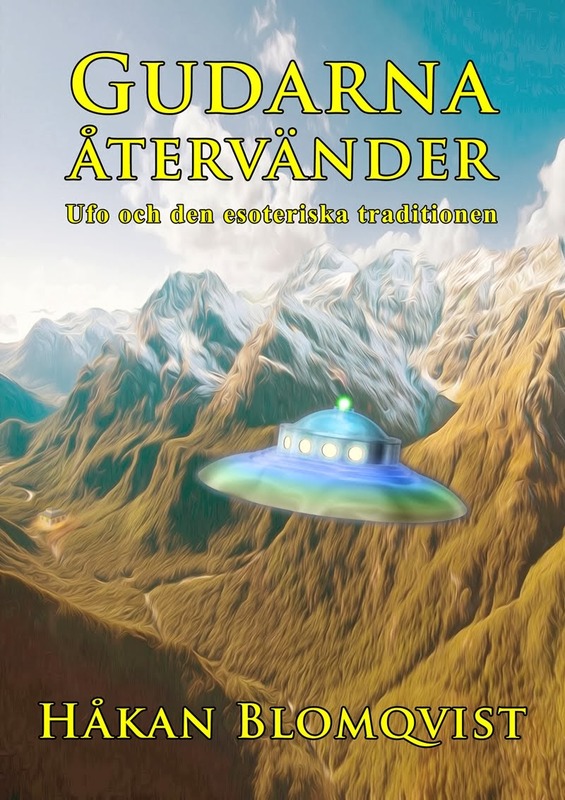 In what way and how much did ideas from the Esoteric Tradition influence the Swedish UFO movement? 7. Henry T. Laurency and the Esoteric Tradition. 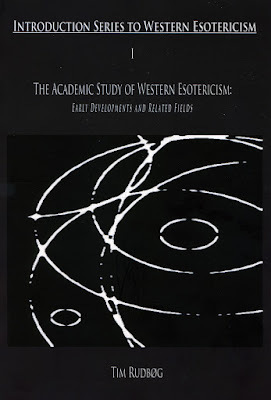 The writings of Swedish esotericist Henry T. Laurency, pen name for Henrik von Zeipel (1882-1971) are to a large extent unknown even among scholars of Western Esotericism. 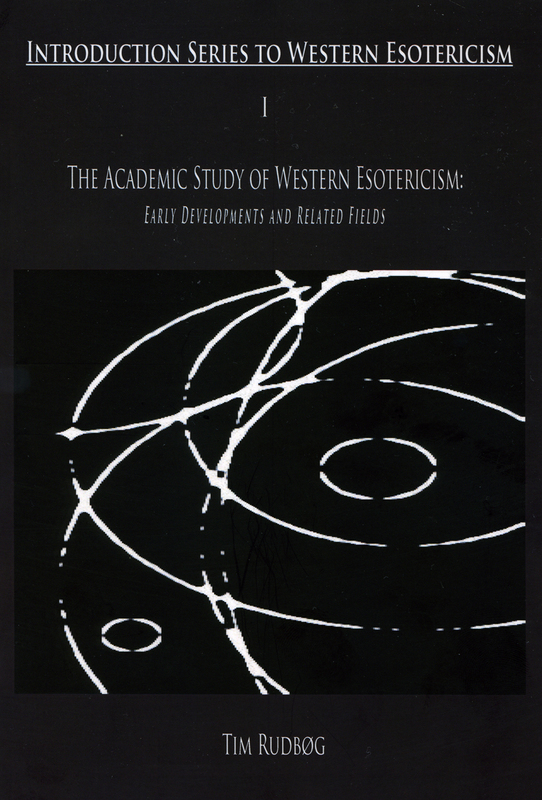 In what way have his books contributed to our understanding of esotericism as a worldview? There is an interesting and rather sensitive dilemma associated with this area of research. A problem addressed by Dr. Jean-Michel Abrassart in his essay Paranormal Phenomena: Should Psychology Really Go Beyond the Ontological Debate? 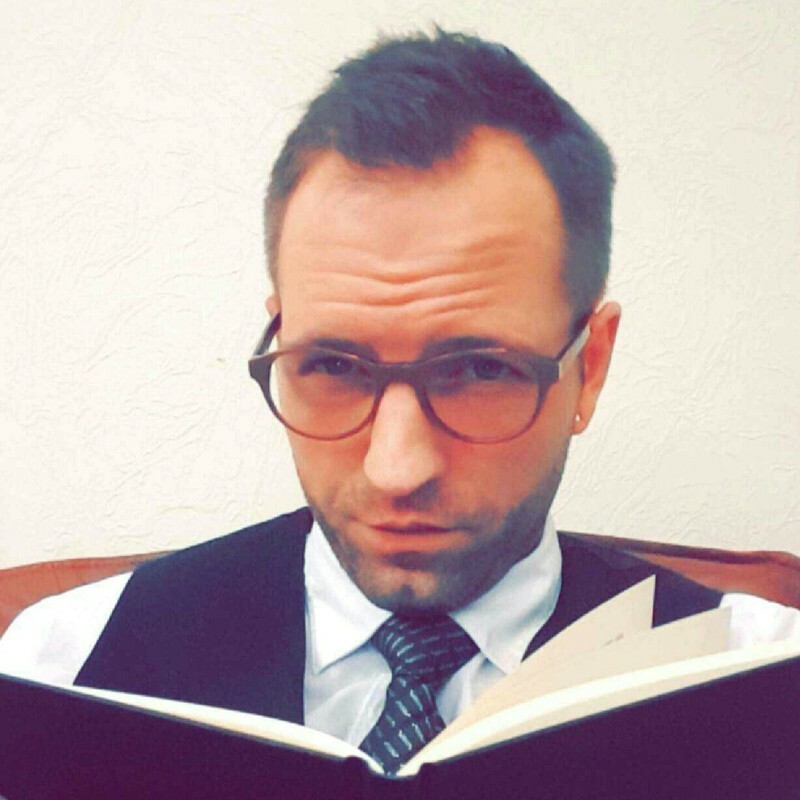 Should academic scholars state their own beliefs on the topic they are studying? That is, being honest in regard to religious, esoteric affiliations or adherence to some specific paradigm or worldview? Being open minded in this respect can be detrimental to the academic career and result in a loss of intellectual integrity in the academic community. I agree with Dr. Abrassart in his views but the idea is fine in theory but the practice may not be so easy. 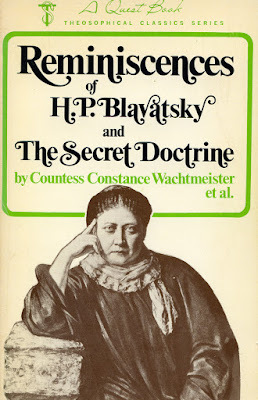 As blog readers have noted I have personally clearly and openly stated my position or worldview as esotericist in books, articles and blog, an adherence to the Esoteric Tradition as presented by Helena Blavatsky, Alice Bailey and Henry T. Laurency. This is no problem to me as I have no affiliation with any University or official research institution and as retired librarian I can be as heretical and iconoclastic as I please. It is only my esteemed colleagues in UFO research that may raise a few eyebrows at my writings and wonder if I have committed intellectual harakiri. 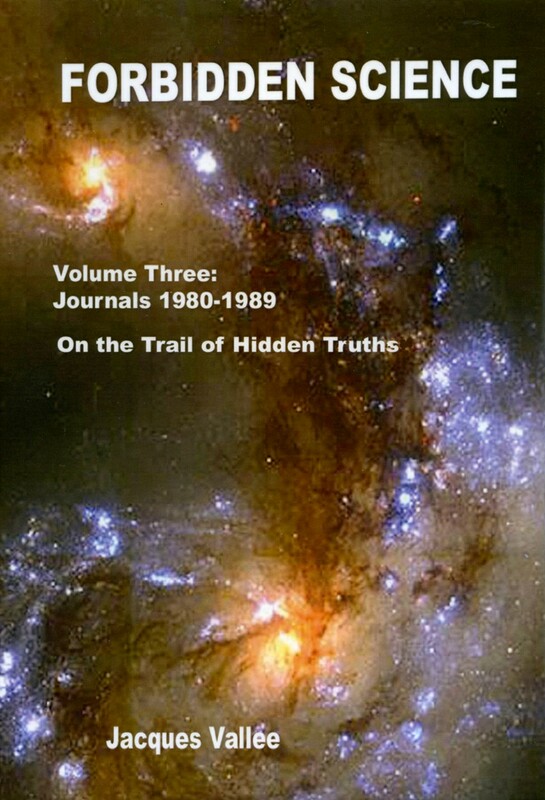 Field investigation with the object of determining the reality of UFO phenomena has no natural academic connection. Any academic scholar trying to address to ontological (reality) issue will immediately be questioned by collegues and university administration and face public media ridicule as the strange scholar who believes in little green men. He or she will also be heavily criticized by the new inquisition (not the Catholic Church this time) but by the representatives of the Skeptic community, condemning the heretic for promoting pseudoscience and irrationalism. Few scientists are willing to put their academic career at stake when faced with such obstacles. 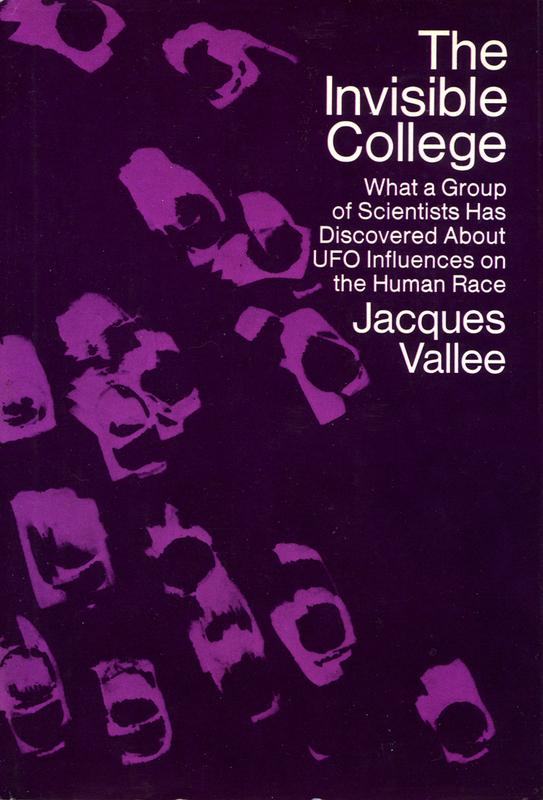 An Invisible College of critical but open minded researchers affords the best option and protection in such a cultural situation. The common media strategy of asking an astronomer or other mainstream academic scholars to comment on the the reality of UFO phenomena is like asking an ornithologist for a view of Byzantine architecture. The basic mission of the military and intelligence community is to protect the nation from inner and outer enemies. By necessity much of military research and intelligence operations must remain secret. UFO research sometimes involves cases where the field investigator probably documents activity associated with secret military projects, remotely piloted vehicles (RPV), drones or other forms of covert activity. The possibility of black projects like military abductions, MILABS, is a case in point. Research into these more or less secret areas will of course be very controversial and only a privately financed institution could hope to achieve results in these areas. Basic research into the reality of UFO phenomena is not a part of military mission. Politicians today are very much at the mercy of various media and often quite defenseless if they happen to make a mistake or say something inappropriate or wrong. Any politician advocating serious UFO research would immediately receive negative publicity in the press and become an embarrassement to political colleagues. Demands for resignation would follow. "We don´t want a UFO nut in our political party". As very few people are aware of the depth and extent of the UFO enigma and the serious issues involved there is no possibility in official funding of UFO research nor of help from politicians. This criticism should not be seen as depreciating academic research in these controversial areas, but only to show the problems and restrictions involved. As mentioned earlier I really commend the founding of Copenhagen Center for the Study of Theosophy and Esotericism, looking forward to many interesting monographs and dissertations. 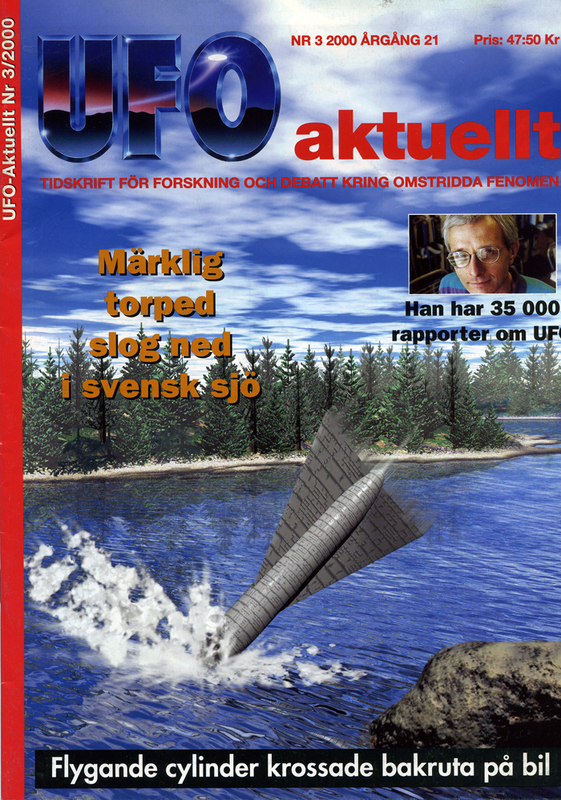 Late afternoon on July 27, 1999 several witnesses observed a missile or rocket shaped object crash into lake Backsjön, north of the town Arvika in the province of Värmland, Sweden. The object was about three meters in length with small wings at the sides. It hit the lake with a splash resulting in a large water cascade. One of the witnesses called the local rescue service and eventually a unit from the Swedish military began an intensive search for the missile. During the first days of investigation the military gave various cover stories to the press of what had happened. They interviewed seven witnesses who were all regarded as very credible. After some preliminary dives in August a ten days search was initiated in September with a small submarine equipped with ultrasound and cameras. In spite of a very detailed search in the lake, nothing was found and this was very confusing to the military. ”We considered this report as credible. 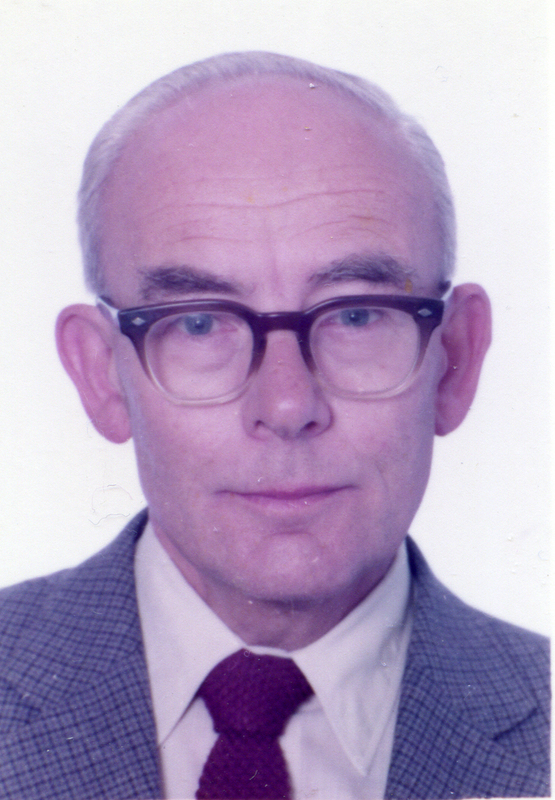 The search resulted in nothing and we really don´t know what we are looking for”, commented colonel Yngve Johansson. The Backsjön case makes it quite obvious why these type of unknown craft are called Ghost Rockets. 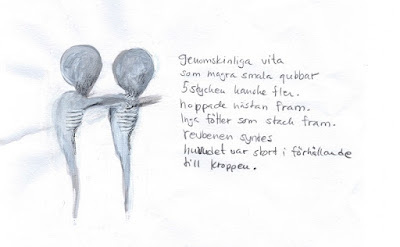 Since 1946 there have been hundreds of well documented Ghost Rocket reports in Sweden. Always with the same scenario, apparently physical objects crashing into lakes and the military finding nothing in spite of intense search. Swedish ufologist Clas Svahn have investigated the Ghost Rocket phenomenon for many years and regard these reports as one of the most intriguing type of UFO observations in our country. 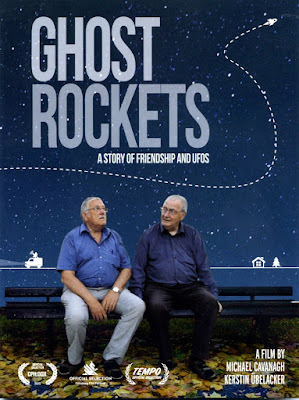 In 2015 filmmakers Michael Cavanagh and Kerstin Übelacker released the UFO documentary Ghost Rockets. A film about the national organization UFO-Sweden and the expedition to find a Ghost Rocket that landed and sank in lake Nammajaure, in the north of Sweden 1980. After two expeditions nothing has been found so far but there are indications that some object may be hidden deep in the mud in this small lake. Hopefully a third expedition may give some final results. To the skeptic the lack of physical evidence for the Ghost Rocket reports prove that these reports are nothing but a myth based on misidentification of ordinary objects. To mainstream scientific ufologists the Ghost Rockets are an intriguing enigma indicating unknown air vehicles. But to the open minded researcher the lack of physical evidence opens up a third option usually not considered by the two former groups. Before the Robertson panel of 1953 and the general silence policy on the subject from 1954 American contactee George Van Tassel were sometimes visited by military men from the Air Force who had a personal interest in or had become involved in UFO incidents themselves. He related several such incidents and talks in his magazine Proceedings. 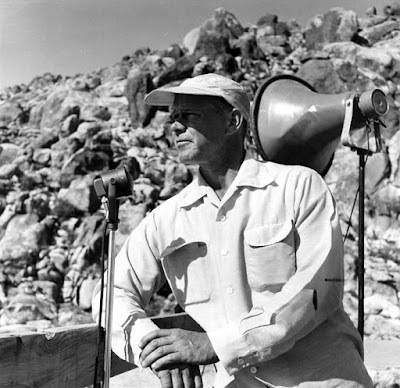 In 1953 an Air Force Major, stationed at George Air Force Base, at Adelanto, California, spent many weekends with the Van Tassel family at Giant Rock Airport. The major was officially in charge of UFO investigations in Southern California. An interesting case he had been involved in told of jet pilot who radioed George Air Force Base tower that a round unidentified object had crashed into the ground near San Jacinto Mountain. The Tower phoned the Major and hurriedly he and other Air Force personal climbed into a helicopter and headed for Mt. San Jacinto. They spotted the jet circling the area and landed the helicopter in a clearing about 200 feet from the unknown object. ”The Major said they walked slowly toward it and when they were about 25 feet from it they stopped in awe because the couldn´t figure out what was happening. The Major said the object was apparently remote controlled, and was in the process of some automatically activated ”self destruct” proceedure. He said the object had a pulsing bright light in tghe middle of an ovoid mass, of what looked like black tar about two feet thick and about 12 feet in diameter. The entire black mass was quivering like jelly, shaking and getting smaller by the minute.” (Proceedings, vol. 10, no. 6, Oct-Dec 1974, pp. 11-12). In a short time the black blob dimished until there was nothing left and the pulsing light just vanished. The group took samples of the ground where the object had been and also samples of the earth a hundred feet away. George Van Tassel never heard what the results were as the Major then stopped visiting Giant Rock when security and secrecy regarding UFOs increased in 1954. ”Whenever possible these complex and highly sensitive little machines are returned to their parent craft, but sometimes, for one reason or another, the connection is broken and they go out of control or crash to the ground. In such cases emergency procedure is immediately brought into action. On each side of the mother ship, just below the disk-launching ports, is a magnetic ray projector. When a disk goes out of control, a ray is projected to disintegrate it. This accounts for some of the mysterious explosions that take place in your skies which cannot be accounted for by artillery, jet planes or electrical storms. On the other hand, if a disk goes out of control near the surface of the planet where an explosion might cause damage, it is allowed to descend to the ground where a milder charge is sent into it. Instead of an explosion, this causes the metal to disintegrate in slow stages. First it softens, then turns into a kind of jelly, then a liquid, and finally it enters a free state as gases, leaving not a wrack behind. This latter process is without danger to anyone or anything should the disk be touched while in process of disintegration. The only harm could come if, by chance, someone should see it fall and touch it at the moment the ray is applied.” (George Adamski, Inside the Space Ships, 1955 ed. p. 155). 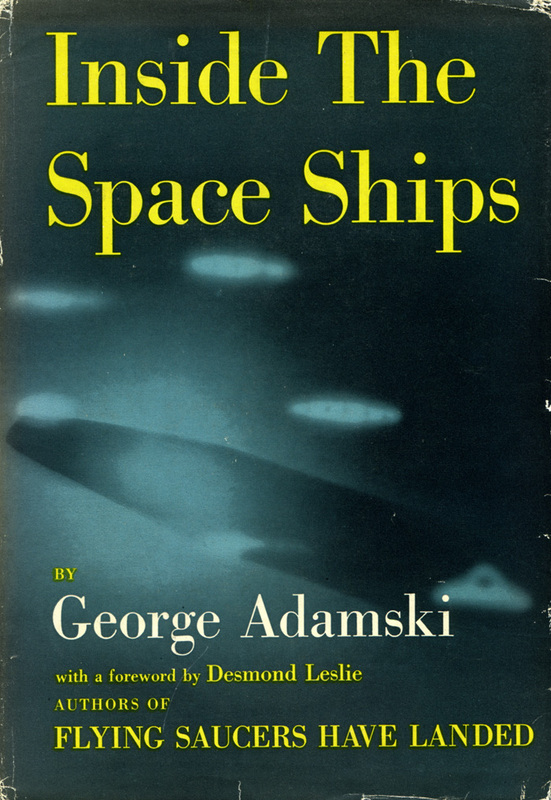 Could the Ghost Rockets be some type of aerial device used by an alien group as described by Van Tassel and Adamski? This is just a theory of course but how come that these strange missiles are never found? And why the large concentration of Ghost Rocket reports in Scandinavia and especially Sweden?